Cupcakes 'n Daisies: I'm Baaaaack . . . . . I'm Baaaaack . . . . .
You really take for granted how much you use your computer until it no longer works. I didn't know the temperature, so I never knew what to wear when I left the house for a walk or bike ride. My husband asked me a question about a deposit into our checking account and I said, "Oh, I can find that out" and then I remembered, no online banking. The thing I missed the most was the daily interaction with all my blogging buddies. Sometimes, I could bring up a blog, and read what was written, but the pictures would never load. On the one hand, it was great keeping up to date with what everyone was working on, but not being able to see the pictures was torture! Over the last few weeks our DSL provider replaced our line, modem, wireless box and IPO address. I'm not sure which one was really the problem, but I have my doubts it was all of the above. I did meet and develop a nice relationship with my repair man, Eric. He and his wife are training for their first 5K, have two children, and he wrestled for a college in Iowa. So now, without further ado, what I bought at the quilt show in Paducah. Just incase you forgot, I took $158 to the quilt show in Chicago, bought 3 patterns, but came home with more money than I left town with after a girlfriend pitched in for gas. So my budget was to stay around $150, the amount I collected in change over the last year. the pattern and makings for an adorable cupcake pin cushion by Pieceful Designs. 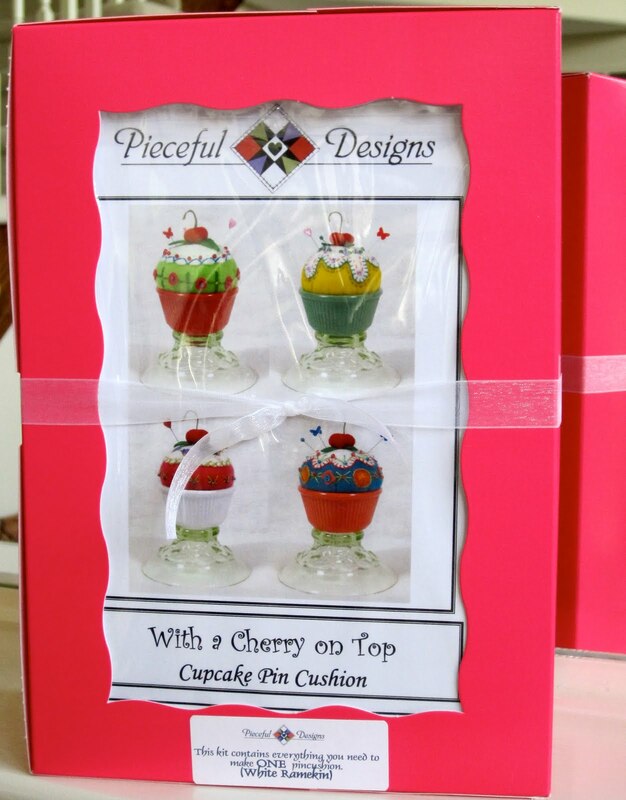 I saw these cupcakes at the Quilt Show in Chicago, but just gave them a cursory glance due to the congested vendor area. They were also at the quilt show in Paducah. I stopped to get a better look at them and was immediately engaged in conversation by a very pleasant and persuasive vendor. They are cute, and the saleslady swears they are easy!! I've yet to even open the box, it's packaged so cutely. I've been wanting some sort of hand work, maybe this will fit the bill. I went with the pink pin cushion with the white bottom, but they are all delicious looking. 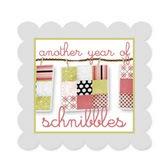 If you go to the Pieceful Designs website, check out the adorable banners and trivet covers, they have some unusual and clever patterns. a fat quarter bundle of Butterfly Garden by Kansas Troubles. My father-in-law turns 90 in October. I thought I would make him a throw using this fabric. I'm still up in the air over a pattern. I've always loved the Kansas Troubles fabrics, I'm glad I found an excuse to finally buy some! Nichole at Sisters Choice made this quilt using Roman Holiday and I've always admired it. Last week I got Carrie's new book, Spice of Life Quilts, Opening Day is one of the patterns included in the book, so now I have two patterns. I also picked up two books by Anka's Treasures. I picked them up from two different vendors and did not notice they were by the same person until I took this picture! this quilt, on display in a vendor booth. The Shams with Style book is my favorite, and it was this one line in the book's introduction that drew me in and had me part with my cash; " We make all these beautiful quilts and unsuccessfully try to match a purchased pillow sham to our hand-made quilts." That's me, unsuccessfully trying to either tuck the quilt around the pillows, throw the pillows on top of the quilt with no shams, or use plain white or ivory shams. It ALL looks bad, I like a nice finished and professional look. This is the main reason I've not used my quilts on my bed, without the fancy pillows and shams, I just did not like the look of my quilts on the bed. There are several shams, pillowcases and pillows showcased in this little 16 page book. And they all can be made in multiple sizes. I've bought extra yardage with my last two fabric purchases knowing that I would want to make some of these great pillows. a fat quarter bundle of Sophia by Windham. It's a splurge because I have no pattern in mind, and also have some Paprika black and red fabric that I don't know what I'm gong to do with, so I don't need another red and black family of fabric. Oh well, I don't have many fat quarter bundles, so it's kind of nice having one in reserve, just waiting for the perfect pattern to come along. I went over my $150 budget, but really just by the amount of the Kansas Troubles fat quarter bundle, and since that's going to be a gift, it shouldn't really count..should it? Thanks for stopping by, I think things are back to normal for me here at Cupcakes 'n' Daisies! I agree! Gifts shouldn't count! I've eyed that pillow & sham book too. I'll be interested to see your first project from it. Oh, great haul, Thelma! I recently ordered some half-yards of Sophia, and, like you, don't have a plan for it, but just couldn't resist. When it arrived I just wondered what I had done. But I lined it up next to the ample scraps I have from Paprika and they really go nicely together, so I may go in that direction. Also, I have that FQ Cottage book and that's what I used to make my friend's wedding quilt recently http://pickledish.blogspot.com/2010/04/goin-to-chapel.html That shams with style book looks very appealing, too! Glad your computer is back in order! You really did make some nice purchases and put a lot of thought into what you bought. I totally agree, the fat quarter pack from Kansas Troubles definitely doesn't count. It is so much fun to go to the big quilt shows. The selection of fabric is fabulous not to mention the beautiful quilt samples on display. I love your finds. Can't wait to see some of these made up. Hope you had a very nice Mother's Day. Glad that you are back to blogging - I've been dying to see your goodies - you got some great stuff! 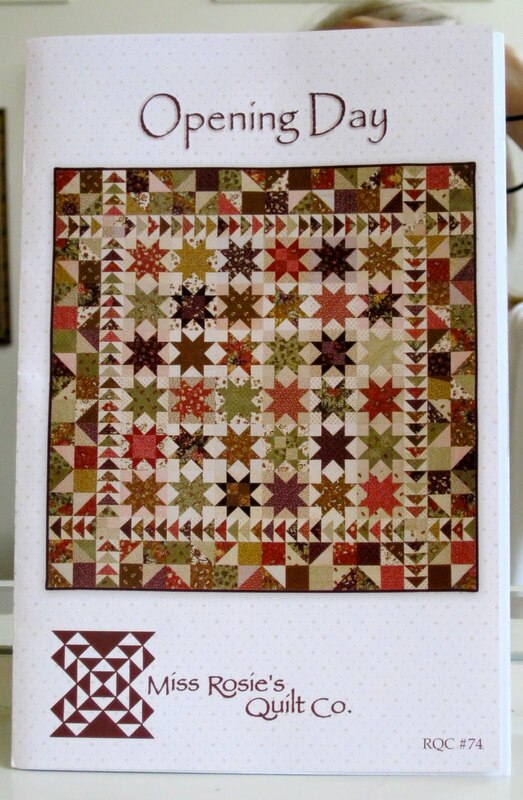 I also love that Fat Quarter Cottage quilt with the stars - that is on my "someday" list. Welcome back! I love your purchases! I wouldn't count the gift fabric either. ;-) Happy stitchin'! Welcome back - you were missed. Awesome purchases. I must say that Butterfly Garden looks even more tempting in your picture. Do you think it's because it's not a stock photo? I love the Fat Quarter Cottage quilt. 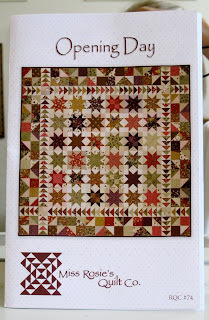 It's very similar to Buggy Barn's Crazy Goose quilt, which is on my "must do" list this year. It's from Sew Unique Creations and if I wasn't already making another Black n Red at the moment I would have snatched up the kit. Anyway, I'm sure you will find the perfect pattern for all that great fabric and I agree, if you are giving it away, don't count it!! I agree gifts don't count! Welcome back Thelma! 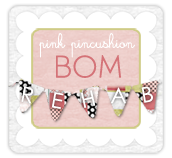 I missed your blog! You scored some great goodies at the show. Love the Butterfly Garden. I have a stack of Kansas Troubles fabrics that I've been hoarding from about three or four different lines, but haven't used them in anything yet. I love how so many of their fabrics from other lines all coordinate together so well. I also have that star quilt from Fat Quarter Cottage on my to-do list. It's a real stunner, and such a simple, clean design. And I imagine most any group of fabrics would do well in it. Sophia! Be still my beating heart! I have this bundle on my wish list. I just love it. I was hoping to pick it up for my birthday, but I happen to know Keith got me something sparkly for my birthday, so I won't push my luck. But I have certainly been drooling over it for a while. It will mix in with all my Garibaldi fabrics perfectly. So glad to see you back online. Yes, we DO rely on the internet more than we like to admit, until we lose it. Have agreat week! I'm so glad you're back . . . I've been checking everyday . . .
now I can't wait to see what you've beening sewing !! What a wonderful haul of great stash. Love, love that fabric you picked up and everything else. I just picked up someof those ramkins from the grocery store not exactly sure what I'd used them for. Well, the cupcake pattern is perfect so I'm going to have to order it!! What wonderful purchases! You did great! I love the star quilt. I think I need to order that book...I want that quilt. Thelma so glad you are back!!! Great purchases. I am intrigued by the pillow shams patterns. Great idea and makes sense. Wonder why there aren't more of those. So happy things are back on line for you.. I haven't seen the Sophia line before! Maybe you could cut into it for Judy's mystery quilt coming up?!?! glad to have you back Thelma. I too have been gone a bit too, but to dance competitions with my girls. No fat quarters for gifts don't count in the budget... I just did that too at Quilt Canada!! Woo hoo! So glad you are back! I missed you my friend :-). We are so dependant on computers these days. When my desktop computer was out of commission for over a week in January I felt like I'd lost a limb. I still had the laptop for internet access, but all of important stuff is stored on the desktop and was pretty much inaccessable. On a happier note, you got some great stuff at Paducah! I can see why you were tempted by Butterfly Garden. The pictures online do not do that fabric justice and when I saw it in person in April, I ended up coming home with two layer cakes and two charm packs. Pre-cuts were 25% off, alhough if they would have had a FQ bundle I probably would have bought that at full price. That fabric is absolutely gorgeous and you just can't go wrong with Moda quality. I just blogged about getting my Spice of Life book as well as Carrie's other new book. Both are great. Heather Peterson af Anka's Treasures is a great designer as well. I also enjoy her blog. And Sophia. Wow. That fabric is stunning. I can't wait to see what you make with it. Once again, welcome back! You were greatly missed. Schnibbles in a Schnibbles . . . . .
Change is in the air . . . . . . Analysis Paralysis ! ! ! I Spy Selvages . . . . .
Roundabout, Madeline, and Flora . . . . . . .
Catch Up . . . . . . . . .
Internet Woes . . . . . . .